With the release of the first public beta of Internet Explorer 8, two new features come to light: Activities and WebSlices. You can see a demo of both in Joshua Allen’s interview with Jane Kim. I think of Activities as next-generation bookmarklets, and also as kissing cousins to the OpenSearch providers that you can add to the browser’s search box. WebSlices are something else again. They transform pieces of web pages into little feeds that you can subscribe to. For all its power and utility, feed syndication hasn’t yet really sunk into the consciousness of most people. I’m hoping that WebSlices, which are dead simple to create, will help bridge the gap. The orange feed icon in the toolbar changes to a (presumably not final) purplish thingy. And when I hover over the second slice, another of those pops up. Both are lit, indicating there’s fresh content. I like this for a couple of reasons. First, because it will give microformats a big boost, and propel the data web forward. Second, because it will introduce many more people to the whole idea of subscribing to feeds. There’s a big conceptual barrier there that we haven’t yet brought most people across. I’m hoping that a new way of subscribing to a new kind of feed will also raise awareness about the old ways of subscribing to conventional feeds. Author Jon UdellPosted on 5 Mar 2008 5 Mar 2008 Categories . I share your hope that WebSlices will propel the data web forward, but I don’t see how it could possibly give microformats a boost. Microformats are much more closely tied to an open collaborative process based on research of real-world publishing than the specific markup fragments resulting from that process. WebSlices appear to be the product of a very different kind of process. From the perspective of microformats, building the tools first and encouraging publishers to follow is completely backwards. We might get lucky here and the publishers will adapt to the tools, but adapting the tools to the publishers has a much better track record. Like Scott, I share your hope that WebSlices can help in the education battle around syndication. Syndication has become such a natural and central part of the geek info ecosystem over the last couple of years since the introduction of RSS and so many of us have lost track of exactly how confusing this stuff can be for civilians. I think you’re fighting the good fight in opening what may be a closed wound for a lot of devs: the usability of feeds. On the other hand, I would extend Scott’s criticism of the a priori design of the WebSlices ‘microformat’ to include the design choice of putting the responsibility for indicate slices in the hands of page authors. Having the publisher pick what material is available as a feed seems kind of backwards. The way the Safari 3 “Web Snippets” feature handles this seems much more natural to me. A user can select any element on any web page to create a snippet which is made into a dashboard widget which then continuously updates itself to stay in sync with the content on the original web page (I’ve got a little write up of using web snippets to interact with iwantsandy.com that might illustrate the point). WebSlices needs both publisher and user comprehension and buy-in to be effective and the lack of either will dampen the utility of the feature for the other group, creating a chicken-and-egg problem in adoption. Web Snippets, on the other hand, work great right now for any Safari users that understand them. And since those of us who do can explain and evangelize the feature, it’s path to growth seems much more clear. PS. Thanks again for meeting with me out here in Portland; it was helpful! I forgot to relay a message I was supposed to: Rael Dornfest says hello. 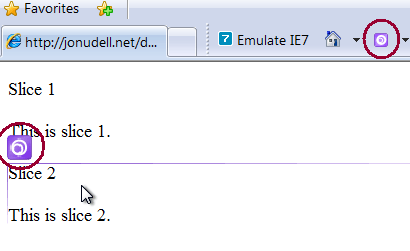 Like most people who know a bit about web standards, I’ve always hated ie. But these new features of ie8 really do look quite impressive, and it’s an unexpected pleasure to see them (as far as I know) coming up with their own, genuinely innovative ideas, rather than copying safari or firefox. *And* they’ve decided to run in standards mode by default. Scott and Greg, these are excellent comments, thanks. Ideally, this can work from both directions toward the middle. Users who can make snippets in a ad-hoc way will help publishers to see the value of producing well-structured slices. 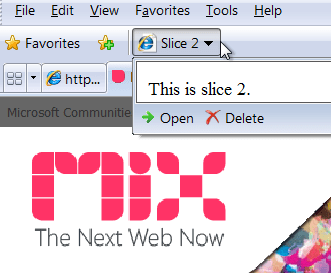 And when users encounter slices, it’ll get them thinking about ways to create their own. Not only by marking up pages they read, but also — my fond hope — by marking up stuff they create. Because, of course, we’re all becoming publishers now. Remember the structured blogging initiative (http://weblog.infoworld.com/udell/2005/03/24.html)? We’re still waiting on that. Maybe this turn of the crank will get things moving. Jon, I’m a little confused, does IE8 do anything with existing microformats, such as those that are consumed by the Operator toolbar for Firefox? Not that I’ve heard but I’d love to be corrected on that. Thanks for the heads-up on the Operator toolbar, will check that out. If IE8 doesn’t do anything with the microformat data that is already being embedded and published, I fail to see how it could be considered to “give microformats a big boost”. Could you explain your thinking behind this a bit more? Because this behavior is built-in, not optionally acquired as an add-on, it’s going to expose a lot of people to the concept. And because it does so in a way that also reinforces the feed concept, I see a nice synergy there. As for hCalendar, hEvent, and friends, I would personally like to see the LiveClipboard idea carried forward. Passing packets of structured data between desktop and web, and between one web page and another, is something that really should be as basic as cut and paste. I think it’s the metaphor that will make many of the envisioned uses of microformats intelligible to people. Well, OK, but historically Microsoft’s penchant for releasing “Nice idea! Hey, we’ve come up with our own implementation that isn’t compatible, thanks anyway.” technologies hasn’t usually done much except warn VCs off from an area of investment. Also note that it’s not that unusual for Firefox add-ons to serve as a testbed for experimenting with technologies and features before they are incorporated into the main browser once they proved their utility and popularity. This seems to me a better approach than springing new features and formats fully formed as from the forehead of Zeus. It seems to me that will give microformats a bigger boost. the thing I found annoying is that when I added the slice, the favorites toolbar was displayed. I’d rather go the exlorer bar instead (ctrl+shift+j). It’s an incredibly useful approach. As you know I’m a big fan of incrementalism and exploratory development. I’ve also noticed, though, that many good ideas never emerge from that phase into the mainstream. As Perl folk say, there is more than one way to do it. Hope so. The idea needs all the wind behind its sails that it can get. I’ve also noticed, though, that many good ideas never emerge from that phase into the mainstream. Well, sure. Companies should feel free to use whatever marketing tools (and market power, within reason) at their disposal to *move* ideas and implementations from that phase into the mainstream, but that’s not exactly what’s happening here. Instead, this seems more like an attempt at a preemptive first strike to establish proprietary functionality deliberately *incompatible* with the work that has been developed incrementally in full public view. To paraphrase a famous literary critique: The IE8 beta is both innovative and good. Unfortunately the parts that are good are not innovative, and the parts that are innovative are not good. As a happy user of Operator and Semantic Radar, I like the direction that browsers are going, but what about the authoring tools. I’ve watched at least two corporate web design operations and in both cases, microformats and semantic markup were not in the discussion and the people responsible for authoring just are not aware. Now if our authoring tools automatically did this or encouraged users to do so then we’d be in good shape. There’s nothing proprietary about the functionality. I was about to ask: “How long before Firefox extensions show up that do these things?” And then I saw your later comment: it took a day. For me this really is about the hope that by bringing two key concepts together — microformats and syndication — in a package that will reach a lot of people, those ideas will take root and flourish. I’ve spent a lot of time and energy trying to explain these concepts. First, that nuggets of structured data embedded in web pages can have special value, and are worth creating and exchanging. Second, that syndication creates networks of awareness, and that there are all sorts of useful ways to produce and consume feeds. The principles at work, and the applications of them, are just too abstract to make sense to most people. I understand the Operator toolbar because I’m immersed in the concepts, but a civilian wouldn’t know what to do with it, or why. A civilian would, I think, relate to the idea that pieces of frequently-visited web pages — weather info, stock info — can start to surface in other, more convenient contexts. My hope, and it’s only a hope, is that by nurturing that understanding, there will be a broader appeal for a whole class of tools and techniques related to microformats and syndication. If it works out that way, great. If not, no harm done. The (only) explanation I’ve heard for IE including WebSlices and not existing microformats is that microformats focus on commonly-published data (e.g. weather info, stock info), but only provide the ability to parse such data when it’s microformatted. As a result, users will see this data all over the web, but only be able to parse it on specific sites, which will be confusing. I think that position makes some sense, though I think the data is worth that potential confusion. What I don’t think makes sense is your expectation that this is going to change. If IE’s parsing of weather data is subject to all or even a majority of weather data being formatted to a standard, that’s effectively a declaration that such parsing will never happen. In a similar chicken-and-egg data web problem, IE 8 also (still) fails to parse XHTML with a proper MIME type, stifling the progress of XHTML-based-RDF work. From my perspective, there’s a lot of harm being done by IE failing to support these emerging data-web standards. I personally prefer “PageSlices addon for Firefox” for creating web slices from any portion of any web site. You can even store multiple web slices on user pages and create your personal gallery of slices.